Clug: It’s a combination of “clip” and “hug.” And that’s exactly what it does to a bike tire, enabling you to stand your bike—upright or horizontally—anywhere you clug it. 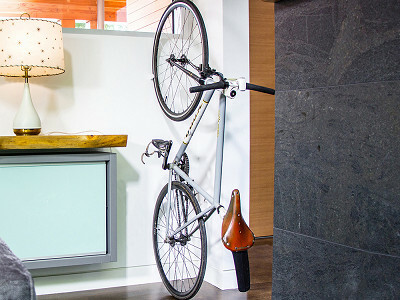 It’s an indoor bike rack small enough to hold in one hand. Clug comes in two parts and installation is as easy as mounting it on two screws. Once the “clipper” (the Clug's outer casing) is mounted, snap in the colorful “gripper.” Just like that, you are ready to clug your ride. Mount it to a wall, your floor, a tree, anywhere you want to park your bike. Then, roll in your tire, and it will make a “clug”-like sound when it catches. Clug isn’t made to suspend a bike. But as long as the unclugged tire remains on the ground, Clug will keep your bike standing. There’s a Clug to fit each common tire width. And since it’s so small, it doesn’t take up any more room than your bike does. Hello, everyone! I'm proud to introduce the Clug to The Grommet. I'd be happy to answer any questions you have. I have a vintage 10 speed bike. Which rack would i need for those tires as they are a little wider than street tires but not as thick as mountain bike tires? @Ken Hi Ken! We sell three versions of the Clug - one to fit standard road bike tires between 23 and 32mm (1 - 1.25"), one to fit hybrid tires between 33 and 42mm (1.3 - 1.75") and one to fit big fat mountain bike tires 1.8 - 2.5" (43 - 62mm). Hi - The Park Place description indicates that the Clug comes in several colors. However, the only color that I see in the ordering process is white w/orange. Can you clarify? Thanks. @Jane Hi Jane! For this launch we just have the one colour available. They are white on the outside and the gripper is orange. Hi Jane, we are working now on adding more colors and should have some in the next few weeks. Stay tuned! What is the widest tire that the MTB version will accept? Will it take a 4" 'fat bike' tire ? @Michael Hi Michael! The mountain bike Clug will accept tires 1.8 - 2.5" (43 - 62mm). I think it's overprice, 25$ for a clamp! 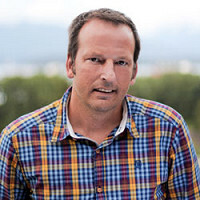 Hi Michel, when you compare it to other wall-mounted bike racks, it is in an affordability league of its own. It also takes up mere inches of space. It's the smallest bike rack available and can be a game changer in the apartment or cluttered house of a bicycle commuter! @Renea Hi Renea! Clug can be used just about anywhere, both indoors and out. Hi! Could I attach the clug with command strips? I live in a dormitory and am not sure if my school would be ok with me drilling holes in the wall. Hi Liam, thanks for the question! After talking with the Maker and some members of the team, command strips might be the best thing you could use if drilling is not an option, but it may not be effective. There is a bit of force involved in getting the tire into the Clug and a little more when you're removing it. That force may rip the Clug off the wall when you're taking your bike off. It could very well be worth a try, but if you find it does not work, you can find our complete return policy here. Clug: It’s a combination of “clip” and “hug.” And that’s exactly what it does to a bike tire, enabling you to stand your bike—upright or horizontally—anywhere you clug it. 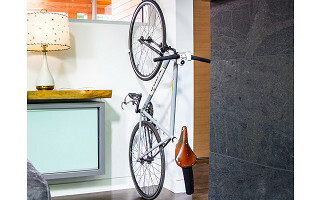 It’s an indoor bike rack small enough to hold in one hand. Clug comes in two parts and installation is as easy as mounting it on two screws. Once the “clipper” (the Clug's outer casing) is mounted, snap in the colorful “gripper.” Just like that, you are ready to clug your ride. Mount it to a wall, your floor, a tree, anywhere you want to park your bike. Then, roll in your tire, and it will make a “clug”-like sound when it catches.